Last Friday night at the Regency Ballroom in San Francisco, working people, organizers, volunteers, eco-warriors, activists, and musicians all came together to Rock Against The TPP. 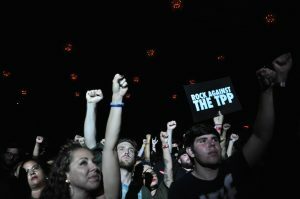 The evening featured passionate speeches deriding the Trans-Pacific Partnership (TPP) and animated acts organized by Fight for the Future as part of a concert series nationwide (plus one for Canada) to campaign their revolution to prevent the massive “NAFTA on Steroids” trade agreement. The TPP, is a trade agreement conceived by hundreds of corporations behind closed doors that will affect ALL Americans, and is stuffed full of chapters and clauses including deregulation in labeling GMO-food products, giving corporations the freedom to sue government if they disagree on their profitable practices (e.g. minimum wage, paid sick days, etc. ), increases in profits for offshoring jobs, increasing medical costs on American families, and even censoring the internet. Organizations including the AFL-CIO, Jobs with Justice, Global Exchange, Friends of the Earth, United Steelworkers (USW), San Francisco Living Wage Coalition, and many more came together to rise up and put on a concert series to raise awareness about this no-good trade deal that could tank our economy and destroy our environment. From the stage, Jane Martin of Jobs with Justice delivered the audience a special reminder of the power in a union. Crowds are standing together and raising their fists, ready to fight the TPP. Gary Graham Hughes, the Senior California Advocacy Campaigner at Friends of the Earth, addressed the importance of unity in the community, saying the breadth of TPP “is like an onion: peel away at it and you want to cry.” For Hughes, pollution in trade is deeply damaging, and folks need to be able to detect “who is organizing and working hard for the planet and people versus green washing bad behavior.” Looking through a larger lens, Cassandra Inglesby, Membership Coordinator of the San Francisco Berniecrats, confronted the overarching issue of putting control of our fundamental freedoms into the wrong hands. “The corporation’s freedom is going above the Constitution and Supreme Court”, she exclaimed while covering the walls with “Stop TPP” posters. 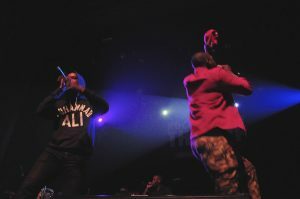 Hip hip duo Dead Prez concludes the show in high spirits and energy. The lineup included performances and engaging speeches by Raw G, Sellassie Frisco, Taina Asili, Evan Greer, Bell’s Roar, Ryan Harvey, Bonfire Madigan, Built For The Sea, Jeff Rosenstock, La Santa Cecelia, Rafael Jesús González, Audiopharmacy, Jello Biafra, and a final blowout with Dead Prez. Take Action to make sure Congress doesn’t pass this massively flawed trade deal during the Lame Duck session of Congress this year. On Wednesday, September 14, join us for a National Day of Action to Stop the TPP! Call your member of Congress at 1-855-712-8441 and urge them to publicly oppose the TPP and work to stop a lame-duck vote!